You are here: Home » Reviews » Don’t Panic! The quick thinking ‘naming’ game! Start the timer and quickly name things which are associated to the words on the game card. The faster you go, the more you score! Easier words are highlighted for younger players. Includes 200 cards. For 2 or moreplayers…. The quick thinking naming game. Includes Don’t Panic timer. Over 200 category cards. 2 or more players; Size H27.3, W27.5, D7.7cm; Weight 1.1g; For ages 8 years and over; As seen on TV; EAN/MPN/UPC/ISBN: 5020674938206. WARNING(S): Not suitable for children under 3 years old. * 4640253 18.49. This toy costs approximately £19.99 (for the latest and best prices make sure you check our retailer list for the Don’t Panic! above). 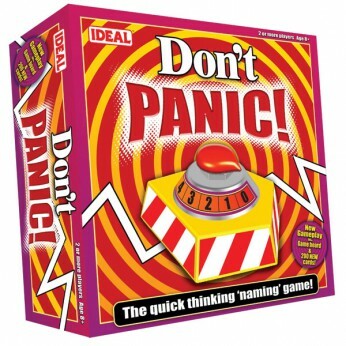 In our review of Don’t Panic! we classed it as being suitable for ages 9 years, over 10 years but recommend you check the manufacturer specific advice before purchasing.